U.S. law enforcement agencies have generally responded to 9/11 with a pretend counterterrorism policy. They still insist that naming the enemy as Islamism causes terrorism, that Islamist violence poses no more threat than that of neo-Nazis, racial supremacists, et al., and that counterterrorism primarily involves feel-good measures such as improving civil rights, passing anti-discrimination laws, and displaying goodwill to Islamists. 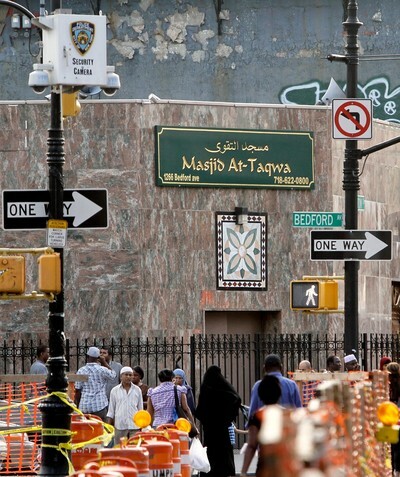 Note the New York Police Department security camera, upper left, outside Masjid at-Taqwa in Brooklyn. And then there is the New York Police Department, an institution uniquely spurred by 9/11 to abandon its former laxity and get serious. The force that had mishandled prior terrorist incidents (e.g., the assassination of Meir Kahane) quickly transformed itself into an outstanding counterterrorist agency under the remarkable leadership of Raymond Kelly. (Andrew McCarthy calls him a "godsend"). Unlike other law enforcement institutions, NYPD names the enemy, acknowledges the predominant threat of Islamist violence, and built a robust intelligence operation. The public saw first hints of these changes in 2006, in the course of the Shahawar Matin Siraj trial. The government convicted Siraj, an illegal Pakistani immigrant planning to blow up a subway station, on the basis of information from two NYPD Muslim spies: a paid police informant, Osama Eldawoody, and a pseudonymous undercover detective, "Kamil Pasha." The latter testified about his serving as a "walking camera" among Muslims living in Brooklyn, to "observe, be the ears and eyes" for the NYPD. Christopher Dickey provided the fullest picture of the department's achievements in a 2009 book, Securing the City: Inside America's Best Counterterror Force--The NYPD. Now, just in time for the 10th anniversary of 9/11, the Associated Press published a series of breathless investigations by Adam Goldman on the department's methods, focusing on NYPD cooperation with the Central Intelligence Agency, thereby bringing the department under intense political scrutiny. Goldman reports that the department dispatched officers to Pakistani neighborhoods and "instructed them to look for reasons to stop cars: speeding, broken tail lights, running stop signs, whatever. The traffic stop gave police an opportunity to search for outstanding warrants or look for suspicious behavior. An arrest could be the leverage the police needed to persuade someone to become an informant." NYPD established the Terrorist Interdiction Unit to handle these informants, including "mosque crawlers," "café crawlers," shopkeepers, and nosy neighbors. John O. Brennan, left, assistant to the president for Homeland Security and Counter-terrorism, met with NYPD Police Commissioner Raymond Kelly, center, and Deputy Commissioner of Intelligence David Cohen at police headquarters in Sep. 2009. It established the Special Services Unit to handle operations outside of New York City, where NYPD lacks jurisdiction, including several American states and eleven foreign countries. The effort has its share of successes; for example, a Muslim NYPD officer working undercover in New Jersey had a major role in Operation Arabian Knight, the June 2010 arrest of two New Jersey Muslims who pleaded guilty of planning to join the Somali terrorist group al-Shabab and then kill American troops. It also established the Demographics Unit to "map ethnic residential communities within the Tri-State area [New Jersey, Connecticut, and New York State]" and to send undercover police officers, or rakers, to monitor Muslims. Made up of 16 officers speaking among them Arabic, Bengali, Hindi, Punjabi, and Urdu, the unit lists 29 "ancestries of interest," all of them predominantly Muslim, including one described as "American Black Muslim." In all, NYPD identified 263 of what it calls "ethnic hot spots" in the city, plus 53 "mosques of concern." 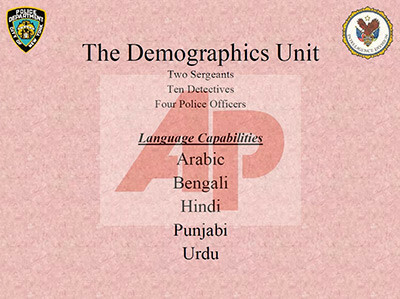 The Demographics Unit consists of 16 officers with multilingual abilities. Rakers filed daily reports on life in New York's Muslim neighborhoods. Goldman and co-author Matt Apuzzo note that they "visited Islamic bookstores and cafes, businesses and clubs. Police looked for businesses that attracted certain minorities, such as taxi companies hiring Pakistanis." They got personal, Goldman goes on: "If a raker noticed a customer [in an ethnic bookstore] looking at radical literature, he might chat up the store owner and see what he could learn. The bookstore, or even the customer, might get further scrutiny." Goldman and the Associated Press clearly disdain NYPD tactics and hope to neuter them. But those tactics have protected New York from thirteen failed or thwarted terrorist plots, Commissioner Kelly stands by them, and they garner wide political support. New York City's Mayor Michael Bloomberg praised the NYPD for a "very good job" and John Brennan, Barack Obama's counterterrorism adviser, lauded its "heroic job." U.S. Representative Peter King (Republican of New York) commended its methods as a model for the federal government. King is right: every other Western law enforcement agency should adopt the approach of "America's best counterterror force." Apr. 24, 2013 update: In the wake of the Boston marathon bombing, Judith Miller has an important article on this topic, "How to Stop Terrorists Before They Kill," in today's Wall Street Journal. Related Topics: Counter-terrorism | Daniel Pipes receive the latest by email: subscribe to the free mef mailing list This text may be reposted or forwarded so long as it is presented as an integral whole with complete and accurate information provided about its author, date, place of publication, and original URL.